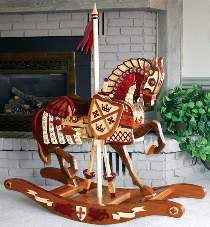 This beautiful horse was inspired by the Knights of the Round Table. The fine details portrayed come from medieval times. The project is packed with fine wood detailing including crests, banners and lions. The color is created from readily available domestic and exotic hardwoods. Plans outline instructions for building the armor-clad horse, shield, sword, battle axe, and jousting pole stand with supporting sabers on the base. Project measures 54"H to the top of the pole, 40"H to the top of the head and 30"H to the seat. Rockers are 52"L and 17"W.